When I first heard about the KeyMe app, which allows users to, I kid you not, share their keys with locksmiths and friends, I automatically assumed it was a clever hoax. Upon further research however, I discovered that not only is this not a hoax, but in fact, it does a lot more than I was initially led to believe. KeyMe allows users to scan their physical keys, and then store a copy of said keys in digital form ( a digital key-ring ) on their mobile devices. These keys can then be shared with either your local locksmith, or a trusted friend for duplication. KeyMe, the appropriately named startup responsible for the KeyMe app, has also created kiosks that they have spread across the Manhattan area. KeyMe claims that these kiosks are capable of printing any digitally stored key within 30 seconds. There is however a small fee of $19.99 to print a digitally stored key from the cloud or, between $2.99 and $5.99 for a copy of a physical one. For those of you with a more free spirited nature, the KeyMe kiosks also have the capability to print custom designed keys. 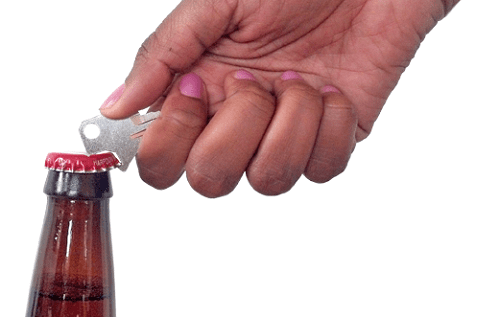 KeyMe users are able to choose from a variety of pre-set designs and patterns even including a convenient “Bottle opener key ”, a key specifically designed to open beer ( or any other type ) bottles. One of the more divisive features of KeyMe is the ability to order your keys by way of mail. This feature will leave many users somewhat conflicted, forcing them to balance a seemingly ever growing need for convenience, with maintaining adequate levels of security. With an app such as this it is clear that security will play a vital role as any potential breach will, almost undoubtedly, mean the end of the company (or at least the app). KeyMe, I am sure, realizes this and as a result, have created a dedicated securities section on their website. The section makes sure to point out that KeyMe does not store information that can be used to link keys to any particular address, as well as, ensuring that users receive email notifications after any key making activity takes place on their account. Is this enough? I will leave that up to you to decide. At this moment KeyMe is only available on the IOS app store (for free) but Android and Windows phone versions are expected to be in the pipeline.